Why build a pick and place machine from the ground up when you can start with a full featured, but non-functional unit, and bring it back to life. That’s exactly what [Charliex] is doing with this Juki 360 rebuild. A bit of background is in order here. 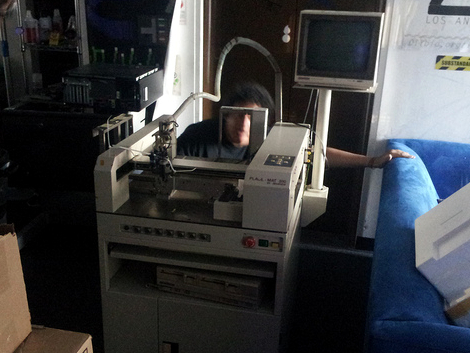 [Charliex] is working alongside other hackers at Null Space Labs to restore this hardware. The Los Angeles based hackerspace sponsored the hardware badges at this year’s LayerOne, each of which was hand assembled. They’d like to avoid that tedium next year, which led to this project. The seller of the used Juki 360 listed it in working condition, but it seems that they were polishing a turd since it is basically non-functional. The link at the top of this post is the second testimonial of their work so far. It covers the use of an Arduino board as a replacement interface, as well as a bunch of sensor repair, pneumatic testing, and motor driver firmware tweaking. If you’d like to see the initial teardown and hardware diagnostics don’t miss the first post in their adventure. It’s the same picture from last weeks post but part 2 of the rebuild (what I assume they did this week). Nice work guys. Awesome. I have seen this before but this is a pretty involved build – I love the arduino replacement of the controllers. A HUGE ton of work remains though to get the functionality they seem to want. The summary should contain a reference to the original post so that people who read the old one will know this is, in fact, an update and not some weird server glitch. Bah, my bad. I just saw it toward the bottom. What’s next? “Scrapping a an old commercial grade pick and place machine”? nope, its up and running!